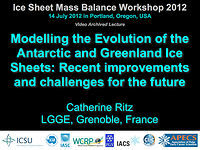 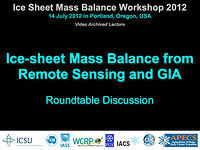 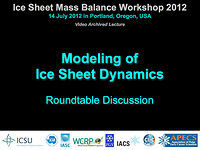 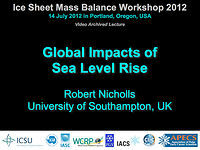 The Scientific Committee on Antarctic Research (SCAR), the International Arctic Science Committee (IASC) and the World Climate Research Programme (WCRP), the International Council for Science (ICSU), the International Glaciological Society (IGS) and the International Association of Cryospheric Sciences (IACS) sponsored this kick-off workshop of the renewed Ice-Sheet Mass Balance and Sea Level (ISMASS) expert group. 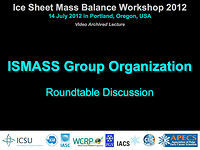 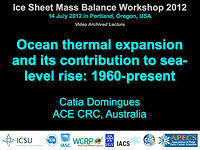 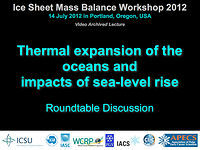 The workshop was held on 14 July 2012 at the Hilton Portland in Portland, Oregon, USA. 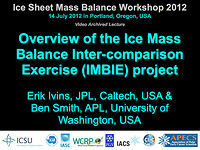 Overview of the Ice Mass Balance Inter-comparison Exercise (IMBIE) project -- Presented by Erik Ivins, JPL, Caltech, USA, and Ben Smith, APL, University of Washington. 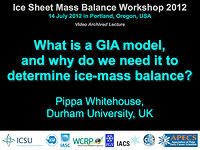 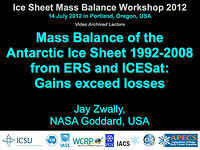 What is a GIA model, and why do we need it to determine ice-mass balance? 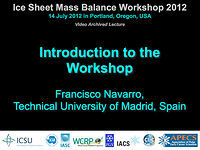 Welcome and introductory remarks to the ISMASS workshop by Francisco (Paco) Navarro.